NBA players are the highest paid professional athletes in the United States with the average NBA player now averaging $4.9 million per year from the league alone. When you factor in endorsements deals from places like athletic wear companies, sports drinks, and electronics manufacturers, that number can easily double or triple. Did you know that approximately 1 out of every 2 NBA players will sign with Nike before they even play their first game? Most don’t. In fact, there is a misconception among many people on how shoe deals for NBA players work. In order to understand why NBA shoes are a multi billion dollar business today, we have to look at how we got here. In 1917, Converse began outfitting NBA players with the first ever performance basketball sneaker known as the “All-Star”. An All-American high school basketball player by the name of Charles “Chuck” Taylor began wearing the shoes and soon after graduating high school, traveled to the Converse sales office. He was hired immediately and became the first “spokesman” for NBA shoes, despite not being an NBA player. Taylor traveled around the country promoting the “All-Star” shoes to basketball players at the professional level as well as high school and college level. Within 6 years, his signature was added to the sole and the shoe was renamed the Converse Chuck Taylor All-Stars. Soon enough, Chuck Taylors were synonymous with the NBA. In the 1970’s, Nike jumped into the NBA shoe business by debuting their Blazer shoe. Puma followed soon after that. In response to the threat of competition after dominating the industry for 50 years, Converse released the Weapons shoe and signed Magic Johnson and Larry Bird to wear them. 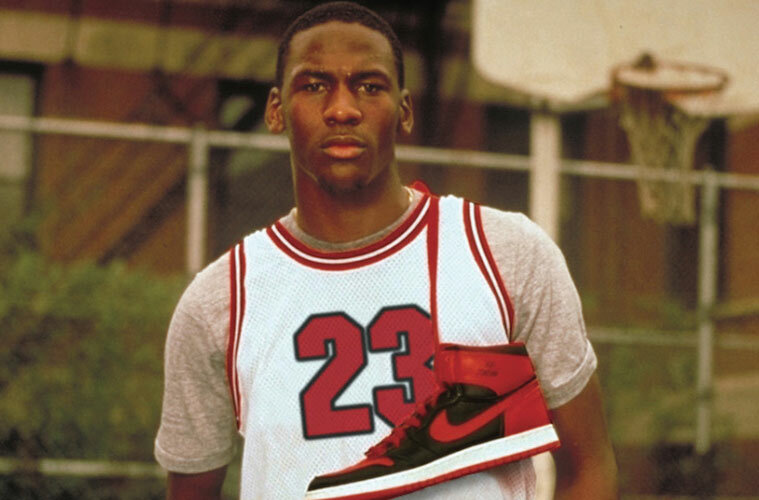 In 1984, Michael Jordan chose to sign his shoe deal with Nike, for $250,000. While Adidas offered $500,000, Nike was offering something that nobody else had ever done: a revenue deal. 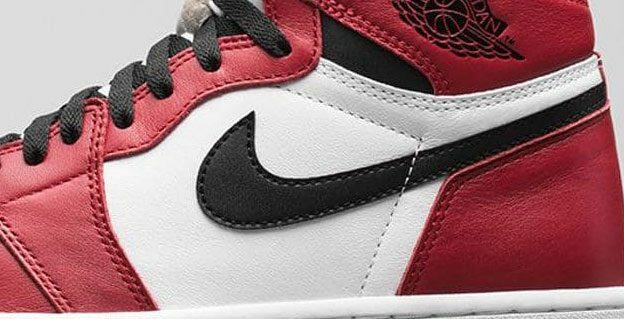 Nike proposed that Jordan take a smaller payment up front in exchange for a percentage of the revenue earned by the shoes. They also stipulated that if the shoes didn’t earn $3 million in the first 3 years, the contract was over. In 1985, Air Jordans grossed $130 million in revenue and the NBA shoe industry was born. Michael Jordan’s first branded shoe, Air Jordans. 1984. “…here in the League, all the players, even those who are just starting, have a personal relationship with sportswear manufacturers. No matter how much stardom a player has, the companies consider it their professional duty to make it so that “even that new guy” represents their brand. It doesn’t matter how much playing time he gets and what year of his contract it is, because he’s already a part of the elite club: the NBA. And this already means a lot in America. While Mozgov signed with Nike for his shoe deal, Under Armour and Adidas are also becoming major contenders in the NBA shoe market. While virtually every single NBA player will sign their shoe deal with one of these three companies, Nike still holds court, commanding a dominant share of the basketball shoe market. However, in an effort to further muscle into Nike’s near-monopoly, Adidas recently signed one of the biggest shoe deals ever with Damian Lillard, eclipsing Kyrie’s Nike shoe deal, and further raising the stakes in the world of NBA shoe deals. Contrary to popular belief, when an athlete signs a contract with a professional sporting organization, the number that is announced is actually the maximum that player can earn during those contract terms. For example, if the hot new NBA player signs a three year, $50 million dollar contract, that means that $50 million is the maximum amount he can make from the NBA in that three year period. In order to achieve that $50 million pinnacle, he must hit every single metric that his contract stipulates to make the money that isn’t “guaranteed.” This includes per game metrics, per season metrics, awards, no fines or injuries and no benching. The same exact concept applies to shoe contracts for NBA players. 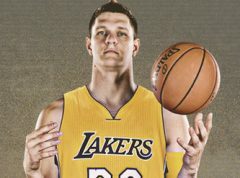 Mozgov’s shoe deal is structured so that he got a signing bonus up front and is then given an account with Nike where he is able to order merchandise from them from his balance with them. That is to say, Nike is paying part of his earnings out in merchandise rather than cash. When he hits certain pre-determined metrics, he is finally paid out in that sweet, sweet cash. Why Do Athletic Shoe Companies Pay? Michael Jordan! Michael Jordan has not played in the NBA in nearly 15 years but his Jordan branded shoes through Nike rang in nearly $3 billion dollars in 2016. Additionally, the Jordan shoe line has a marketshare of 64% of the entire basketball shoe market. Nike branded shoes follow with 29%, followed by Under Armour with 3.6% and Adidas SportsOneSource with 2.3%. Michael Jordan will end up making about $100 million from his Nike Jordan collaboration for 2016. Forbes estimates that $100 million actually beats the $94 million he made in total from the NBA in all 15 seasons combined. When lightning strikes, it is a very lucrative business for everyone involved. It is projected that Nike has made nearly $25 billion from it’s Michael Jordan collaboration. So while an NBA player will sign their shoe deal with one of the major companies, they won’t get a significant amount of money up front. Much of their payment comes in the form of credit to their account with the company and they can achieve cash bonuses based on performance. As you can see, signing an NBA shoe deal is as complicated as signing with the NBA itself. *Ever wonder why new shoe releases for top players cost so much and are never eligible for coupons from Finish Line or free shipping at Foot Locker? These mega-shoe deals are definitely to blame, although if you can wait a few months, they might become eligible for coupons when they aren’t so hot. This entry was posted in athlete shoes and tagged chuck taylor all stars, converse, larry bird, magic johnson, michael jordan, nike, shoe deals, Timofey Mozgov on January 17, 2017 by kevin.